Save the Booths! | Separated by a common language. My friends, there is a serious crisis at hand as we speak. A SHORTAGE OF TELEPHONE BOOTHS! “Why should I care?” Because our superhero men and women will have nowhere to change! I realize that people like Batman have a specific place to change (ie-the Batcave), but where will Superman lustfully rip his shirt open?! In this day and age, there are more cell phones in the industrialized world than there are people! Only 1% of adults use a payphone as their main phone source. What will we do?! Our phone companies can’t continue to absorb all the costs of unprofitable pay phones, especially with significant revenue decline year on year, so they have therefore been reducing their numbers. It’s our responsibility as concerned citizens to express the views of all the groups affected by our decisions- including superheroes, women being beaten up by gangs of thugs with chains, evil doers, and old blind men. 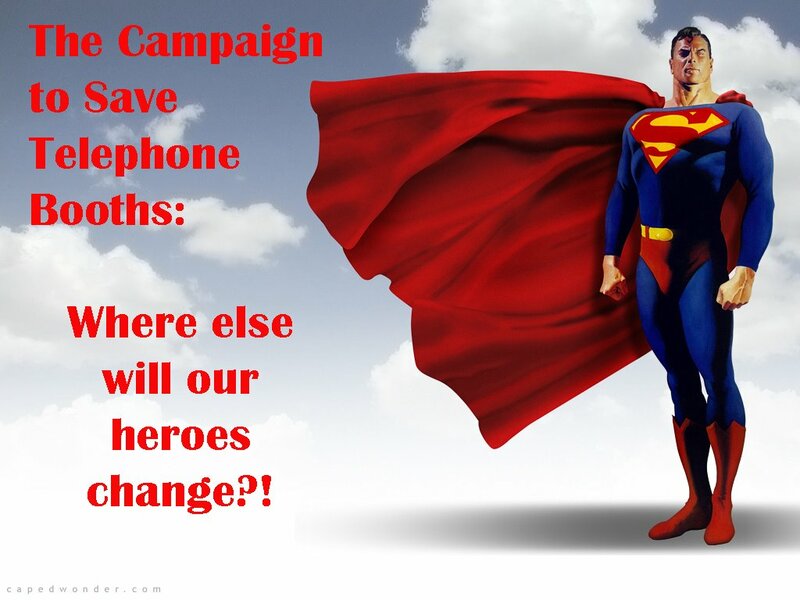 We must express our demands as one unit, united for a cause…The Campaign to Save Phone Booths! We must hold a public protest in each respective city, by DRESSING UP LIKE OUR FAVORITE CHARACTERS and holding a BOOTH-OFF! Stand up my friends, in protest of the declining booth numbers! We must each dress up and lock ourselves in the sweetest phone booth we can find. Only then will they take notice, ONLY THEN will they hear our cries!!! Superman would never change in a taxicab because by entering the vehicle, he would reveal his identity to the cab driver, and as we all know, a secret identity is the most valuable posession to any superhero. If he were so fast, why wouldn’t he fly to a more secure place? He could fly to the Fortress of Solitude, which is always a better choice than a taxicab. Why not even fly straight up? He could fly up so fast no one could see him and he could change in a cloud. Think about it. They’re everywhere (just like telephone booths used to be). In Superman’s case, couldn’t he just fly into space and change there? Or is he worried that the Hubble Space Telescope will see him changing? He should be fast enough such that it isn’t a problem. This is why I think Batman is the superior hero. He doesn’t have super powers. He’s had to overcome general human frailty of body and mind. What’s more, there’s the story of tragedy! What’s Superman got? His whole planet was destroyed while he was too young to remember it. He was taken in by good, loving people. Bruce Wayne, while disgustingly rich, is lonely and can only rely on the Man/Boy love with Robin to keep him sane! Tragedy I say! He changes into Superman IN A TAXI, before flying off to save Lois because she’s a dumb ditz. It was only until the 80s that they started using the phone booth for Superman, before that he just changed whereever. In FACT, in the first Superman movie, there’s a point where he runs up to a phone booth, thinks about it, and decides it’s too risky because of the windows. The only time in Lois and Clark where he changed in a phone booth was because he had to call his parents, and he was in Lois’ apartment, and he was blind and in his Superman costume, and so when Lois is gone he throws on sweats and goes to the phone booth to call them, then he changes back into Superman. But he has changed in a taxi! How dare you bring up Pre-crisis superman in this forum. that’d like telling the church to abide by the rules prior vatican II. Hardly! The actions of Clark Kent pre-crisis, involving how he keeps his alter ego a secret, are crucial! Especially since it’s Clark Kent, NOT Superman, who decides where he changes clothes. Not to mention the fact that he moves at the speed of light, so there’s not enough time for the cabbie to see him, and I know the same applies to a phone booth, but I’m making a point here. pre-crisis and post-crisis are two different people. to say that superman still did this is reffering to the “old” superman. find me an example of superman acting in such a manner after 1986 and then i will agree with you. And he does not move at the speed of light. He moves “faster than a speeding bullet,” which is faster than the eye can see, it is slower than a photon. He can move at speeds close to the speed of light, but cannot surpass it. The only person that can do that is the Flash. And he’s dead. opening and closing a cab door at the speed of light would destroy the cab like a bomb going off. Faster than a speeding bullet, whatever Velma! It’s still damn fast! Can you see a bullet zooming past you? NO! All you know is that something just zoomed past you. On Lois and Clark: The New Adventures of Superman, he DOES change in a taxi. He’s superman, if there’s an emergency, he’s gonna change at the most convenient place. Not just go searching around for a phone booth. lois and clark is not cannon. If it didn’t happen in the comics, it didn’t happen. Well, jinkies. I think we’ve got a mystery here, fellas! While I agree with Steve that we shouldn’t abide by Lois and Clark as an accurate source for Superman trivia, I am a little concerned about the amount of geek that is pouring forth. What’s more, if Clark were to pull open the taxi door (at a reasonable speed,) duck into the taxi and change (faster than a speeding bullet,) and then leave through the open door, the cabbie just notices that his door opened. He probably saw the guy in the suit open the door and then the flash of red and blue flying away. I think it’s possible that Superman could change in a cab. However, it seems like the only reason he would have to hide is if there’s the possibility that someone who knows him might see him transform from mild mannered Clark Kent into a red and blue blur. To me, it seems like it’s more of a device to realistically have a cowardly-looking Kent run from danger before Superman comes in to save the day. This is why Batman is cooler. He changes in his home. The only phone booth I ever saw was last June in some little town in Nevada…. Let me know when you guys hit Phoenix.